Whether you're planning on going on an adventure in a desert or planning to spend some time in the great outdoors, our lightweight, breathable combat boots will make sure you have the time of your life. The upper is made by Microfiber for the black version & Suede leather for the Tan version. The fabric is not only strong but also provides much-needed support to traverse uneven terrains. Our Military Training Boots are ideal for traveling in hot weather, due to being highly breathable, keeping your feet cool and comfortable at all times. Our goal is to make outdoor travel as easy as possible for you, allowing you to enjoy a comfortable experience whether you're travelling through a desert or spending time in a jungle. Our Boots will definitely make it comfortable and enjoyable for your trip and work. Click On the Add To Cart button to buy these Men's Desert Boots today ! MADE TO LAST: Our Mens Microfiber Desert Boots are designed to provide the maximum comfort and durability. The Microfiber material used in the construction of our heavy duty tactical shoes for men not only make our Outdoor Desert Black/Tan Boots for Men durable but thanks to the breathable mesh keep your feet cool and dry ensuring maximum comfort. THE RIGHT PROPORTIONS: When you're in the desert or a jungle, you need a pair of shoes that provide maximum mobility while providing enough lightweight comfort and cradled support to keep your feet firmly grounded. Heel measures approximately 1.77 inches (4.5cm); Platform measures approximately 0.98 inches (2.5cm); Shaft measures approximately 6.3 inches (16cm). LIGHT WEIGHT & SLIP RESISTANT: These Lightweight Microfiber/Suede Combat Outdoor Desert Boots for Men are designed to be ultralight to provide maximum movement whereas the Rubber Outsole is designed to minimize traction loss with an innovative design that provides a better grip on anything the desert, jungle or the great outdoors can throw at you. 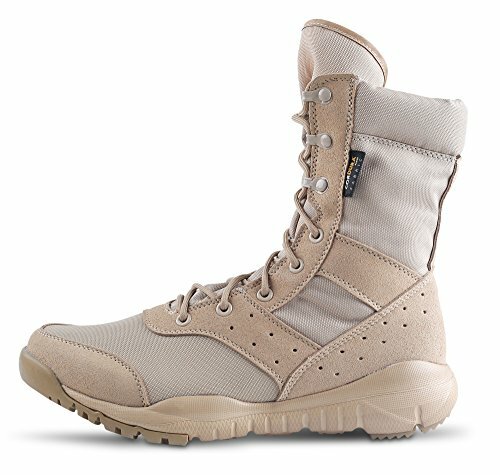 MULTI-PURPOSE USE: Whether you're looking for high-quality tactical army boots or Microfiber/Suede desert boots to provide you the right footing on uneven terrain, our Men's LD Desert Boots & Jungle Boots For Men can also be used by anyone that live an active lifestyle and want high-performance, breathable, durable & lightweight shoes that are comfortable to wear ! QUALITY YOU CAN TRUST: At WWOODTOMLINSON, we have a very simple goal which is making Desert Boots & Jungle Boots For Men that we can be proud of. This is the reason why we invest more time and effort into acquiring the finest fabric for the production of our Tactical Desert Boots to ensure maximum comfort, flexibility, and versatility. So when you buy from WWOODTOMLINSON you can rest assured knowing you're buying the best Desert Boots and outdoor boots for men on the market. If you have any questions about this product by WWOODTOMLINSON, contact us by completing and submitting the form below. If you are looking for a specif part number, please include it with your message.